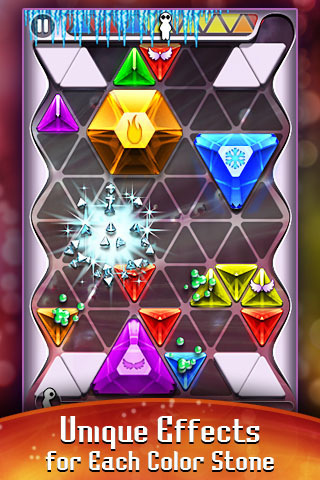 If diamonds really were a girl’s best friend, then I just gained a heck of a lot more BFF’s with PressOK Entertainment’s game app, Flipstones. Both a line-drawing game and a puzzler, you’ll have to get over the allure of the dazzling stones before you can successfully complete the challenges. There really isn’t much to the controls. To move a stone, you can either tap on the stone, then on the spot you’d like to move it to, or you can tap and drag it there. The objective is to clear the board by creating a triangle out of four stones or a hexagon out of six stones of the same color. The further you have to move a stone, the further the little man at the top will move across the bar. Once he hits the other side, he’ll push all the stones he’s passed to rain down randomly on the board. The stones cannot pass over each other, so you’ll have to clear the way; unfortunately, that means more steps for the little man, so plan carefully. After one of the shape has been assembled, tapping on it will activate its special abilities. Completed yellow stones will take out some of the pending stones up top, while green ones emit an acid that eats away at random stones on the playing field. 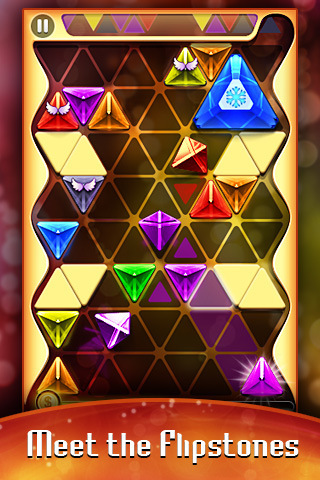 Each color has its own effect, and since the fall of the jewels is random, you never know what the playing field will look like in the next moment. There are two game modes: Endless and Challenge. Challenge consists of 18 stages with over 80 levels in all; sometimes you’ll be under time constraints, sometimes you’ll be given a mission to complete, often times you’ll have to deal with both at the same time. As you move through the levels, the challenges will become progressively harder to solve. Flipstones is a relatively easy game to grasp, but becomes increasingly difficult to conquer as you factor in all the different variables that are in play. A gorgeous game to look at, it features fantastic graphics–which is a very good thing, considering we’re looking at jewelry for the entire game. The effects of the the stones shattering, for instance (coupled with good sound effects), is gorgeous, and all the special abilities play out in intriguingly different ways. It’s easy to get hooked on Flipstones, and you won’t feel too guilty when you look up a few hours later, eyes gritty from not blinking. The only minor issue I had was that sometimes the wrong piece would move across the playing field or the right piece would move to the wrong spot, especially if you were using tapping twice as your technique. Otherwise, Flipstones is an excellently crafted game that’ll keep you entertained and frustrated for a good while. AppSafari review of Flipstones was written by Julie Guan on October 28th, 2010 and categorized under App Store, Featured, Fun, Games, Line Drawing, Puzzler, Strategy. Page viewed 3053 times, 3 so far today. Need help on using these apps? Please read the Help Page.